Richard Macfarlane was born in Glasgow in 1921, the older of the two sons of Daniel and Jessie Macfarlane. He attended Hyndland School and the High School of Glasgow. In 1939 he enrolled at the University of Glasgow to study law, but these studies were interrupted when he joined the RAF in 1941. He was sent to Miami in the USA to train as a navigator. He was commissioned and after further training back in the UK joined 57 Squadron on 9 December 1942. 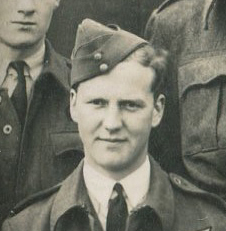 When Geoffrey Rice arrived at 57 Squadron in February 1943, the crew was established and flew on nine operations. They were then posted together over to the new squadron being formed at the same base to undertake training for a special mission. As the most senior navigator in A Flight, Macfarlane became the Flight Navigation Officer. We gathered he was going back to do something special. But he couldn’t tell us what it was. On the morning after the overnight raid we were listening to the wireless and heard the dramatic news. So we were pretty certain that was where Richard had been. They were given leave immediately and he was back at our home in Broomhill, Glasgow, sitting round the dinner-table and confirming he had been on the Dambuster raid that previous night. Macfarlane flew with Rice and the rest of his crew on the handful of successful operations they completed in the period July to December 1943, but they were unlucky on 20 December when they were hit by flak 14,000 feet above Merbes-Le Chateau in Belgium. Although Rice gave the order to bale out, there wasn’t time and the aircraft exploded. Rice seems to have been thrown clear by the explosion, and somehow landed in a wood but the bodies of the remaining six crew members were found in the wreckage. Richard Macfarlane and his five colleagues were buried in Gosselies Communal Cemetery, near Hainaut, Belgium.